The official magazine based on the magical Disney movie Frozen. This monthly magazine is aimed at children aged 3 to 9 years old and continues the adventures of Anna and Elsa. Buy a single copy or subscription to Frozen magazine. Disney Frozen is a computer animated musical fantasy movie telling the story of Anna the fearless princess, Olaf the friendly snowman, Kristoff the rugged mountain man and Sven his loyal pet reindeer. As they set out on a journey to find Anna’s Sister Queen Elsa who has accidentally used her powers to curse the kingdom in eternal winter. 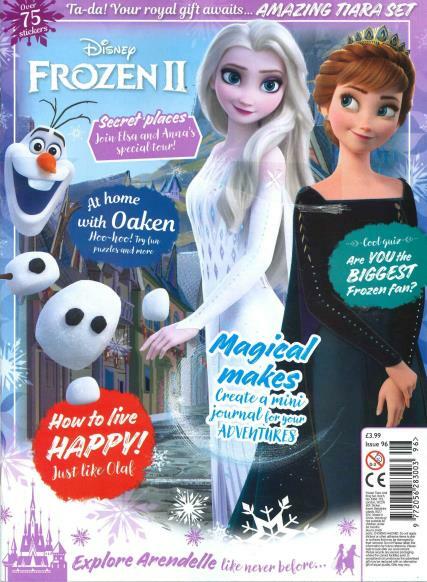 Join Anna, Elsa and all the characters from the popular Disney movie Frozen in this enchanting magazine. Each issue is filled with brand new stories, activities and puzzles, colouring, pretty posters and competition. Plus, lots of fun stickers and a free Frozen gift, perfect for any Frozen fan!